Cumulonimbus clouds are thunderstorm clouds that form if cumulus congestus clouds continue to grow vertically. Their dark bases may be no more than 300 m (1000 ft) above the Earth's surface. Their tops may extend upward to over 12,000 m (39,000 ft). Tremendous amounts of energy are released by the condensation of water vapor within a cumulonimbus. 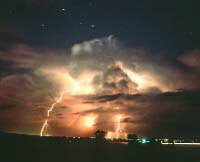 Lightning, thunder, and even violent tornadoes are associated with the cumulonimbus.